Among the mystic saints of India, Meera, the royal princess of Rajasthan occupies a pride of place. Meera adopted Bridal mysticism wherein she transpired love between her and her Lord Giridhari. In all her songs we find the pain of the separated lover seeking to unite with the beloved and the description of joy in union. In this song too Meera express similar feelings and says that she gave up all pleasures for the sake of Lord and now he is making her long for him. He has created the pangs of separation and now she will not leave him. She is his servant birth after birth and asks the Lord to unite in every limb of her. 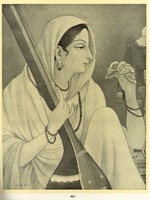 One should listen to Meera Bhajan with Bhakti and Bhava to enjoy the lyrics. For this purpose we are sharing the lyrics with meaning. Listen and Enjoy the divine music sung by Smt Vijaya Rajkotia.